After a long, well-rounded tribute to the 50th Anniversary of The Sound of Music with songs from the film performed by Lady Gaga, the audience at the theatre and at home were treated to the wonderful surprise of Julie Andrews making her way to the stage to talk about her experience on the important film and to thank Gaga for her performance. 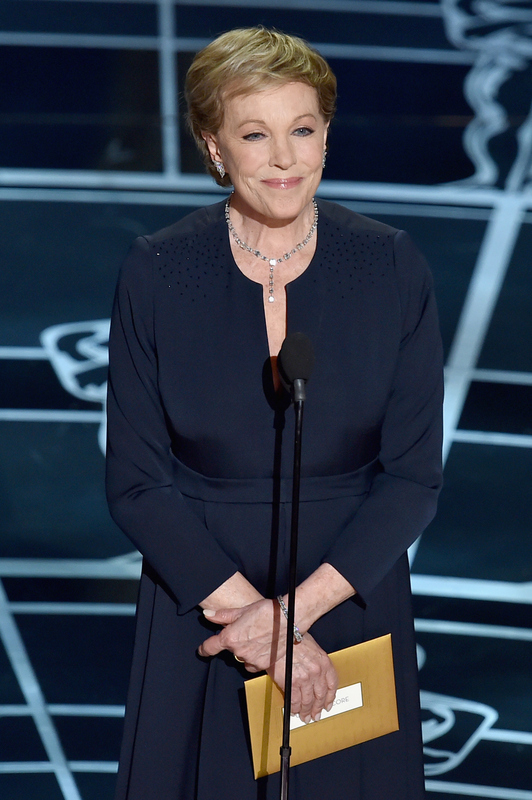 While, as always, Julie Andrews brought class and poise and grace to the entire Oscar proceedings, there's one major thing I couldn't help but wonder while Andrews talked about her time as Maria and more: What was the incredible actress doing these days? I need more Andrews in my life! Sadly we know that Andrews hasn't been able to sing as often as before thanks to a surgery that ruined her vocal chords. But that doesn't stop the incredible lady from continuing to make wonderful strides in film and way beyond. Andrews has continued to make movies, mostly by lending her voice to animated films like the Shrek films and Despicable Me. And unlike Christopher Plummer's experience with The Sound of Music, who hated working on the film in every way except working with Andrews because she is everything, Andrews continues to shower love for the movie and did so with the Von Trapp family actors during the 45th Anniversary celebration of the film in 2010. Julie Andrews has also been writing children's books for years and years with the pen name of Julie Andrews Edwards (adding her late husband's last name). And perhaps most importantly, she continues to support many charities including Operation USA, a non-profit organization that is dedicated to helping communities get help recovering from disease, disaster and poverty through relief, rebuilding and humanitarian aid. Obviously Andrews seems to be just as incredible and beautiful inside and out as I expect and hope her to be. But let's be honest, I'll always look to solving problems like Maria and taking a spoonful of sugar with my medicine thanks to Mary Poppins, all because of Andrews. May she continue to inspire and make us all jealous to be as perfect as her for many years to come.